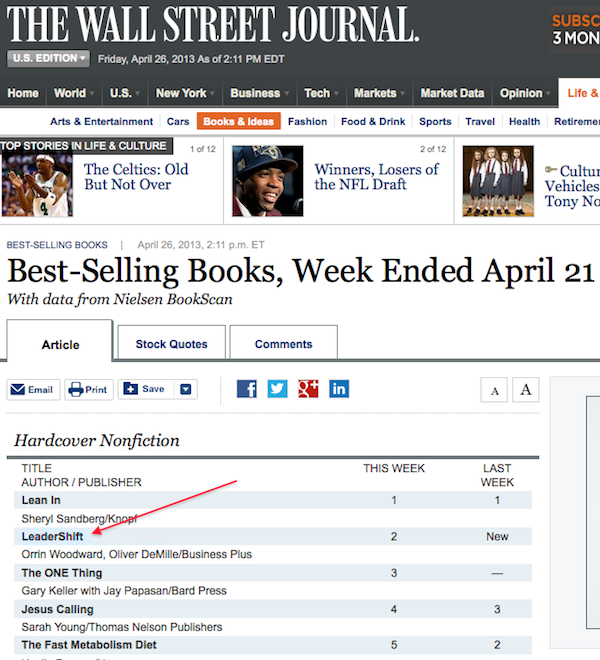 LeaderShift Hits #2 on Wall Street Journal Bestseller List Orrin Woodward’s and Oliver DeMille’s runaway bestsellerLeaderShift hit #2 this week on the Wall Street Journal Bestseller list. LeaderShift describes how the Five Laws of Decline (FLD), first articulated in Orrin Woodward’s Top 100 All-Time Leadership BookRESOLVED: 13 Resolutions for LIFE, is destroying Western Civilization. In fact, every Western Society that collapsed did so through the effects of the Five Laws of Decline; therefore, any turnaround proposed by political leaders must account for and check the FLD. Are you concerned about America, North America, and Western Civilization’s liberties? If so, then read LeaderShift and learn the FLD and how to check them within free societies. Now is the time for all good men and women to come to the aid of their country. Here is the latest WSJ top seller list.